This Lechon Manok Recipe is easy to make; just put the chicken in the pan, put the lemongrass inside the chicken and sprinkle with salt and pepper or drizzle soy sauce for color. Preheat the oven to 325°C. Stuffed the Chicken cavity with the following Tanglad tied together, garlic, bay leaves and Peppers. Put the marinade Mix inside the Chicken. Rub the chicken’s skin with butter, salt, pepper, and garlic. Roast the chicken for 1 hour and 20 minutes or until the chicken is golden brown. While roasting brush the chicken’s skin, with butter. 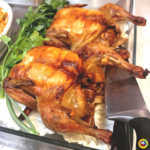 This video shows another way of preparing lechon manok.